In this Muscle MX review, we discuss the company, their products and what they stand for. 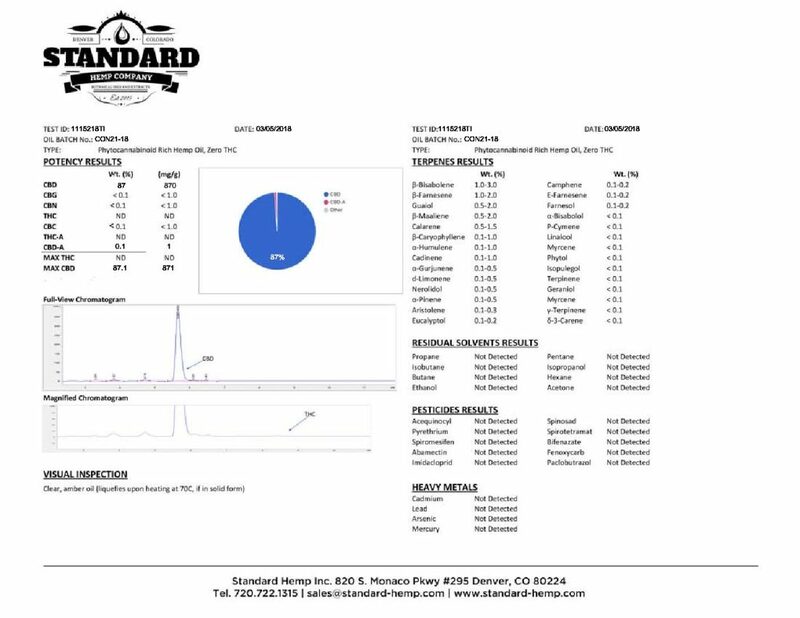 We compare the cannabinoid and terpene profiles with other companies and give them an iDWeeds Rating. Muscle MX is a young company based in Salt Lake City, Utah. They specialize in CBD-infused muscle balms for athletes and fitness enthusiasts. By balancing the best of modern innovation and age-old remedies Muscle MX have developed innovative ways of using cannabis to nurture, enhance and improve lives. All Muscle MX products are handmade and carefully crafted, with a 30-day customer satisfaction guarantee. If you are not satisfied you can return what is left of the used product -within 30 days- for a refund. 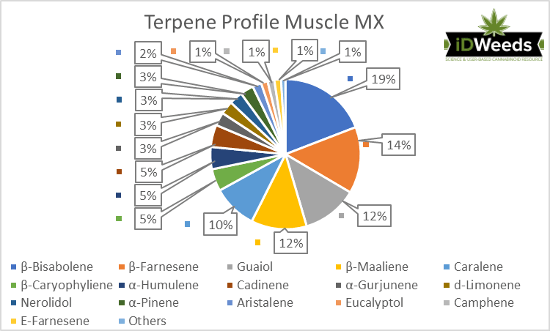 Each Muscle MX product contains cannabinoids such as CBN, CBG. CBD and CBDa, and Naturally Present Terpenes which studies have shown to provide a better therapeutic effect than CBD alone. The products are THC free. iDWeeds does NOT sell CBD products. We compare products from trusted brands to deliver you results based on strength, price / value, and user satisfaction. As the CBD market is flooded with shady scam sites, avoid disappointment and the risk of a contaminated product. The regular bundle contains the standard size pre-workout and post-workout balms. The mini bundle contains mini sized balms. All Muscle MX products are quality tested by an independent third party lab to ensure you get the best product possible. A certificate of Analysis is available on their homepage. Click on a product that suits your needs and go to the order page. 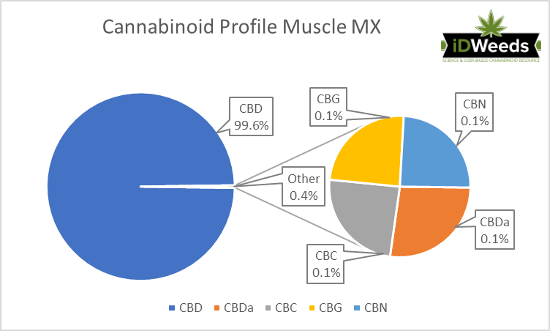 The CBD oil used in the Muscle MX products contains only a small amount of four cannabinoids besides CBD. However, the terpene profile is outstanding. The variety of the terpenes present in small amounts is one of the best we have seen so far. They have two fast absorbing balms infused with rich CBD. Activate CBD Balm. This CBD Workout balm is specially formulated to heat up muscles before exercise. Use Activate on your muscles, joint and tendons before any activity for maximum performance. Recovery CBD Balm. 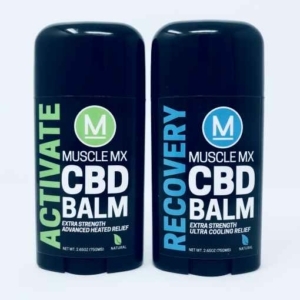 This CBD workout recovery balm is specially formulated to cool achy muscles and provide relief after overexertion. Use Recovery after any activity or to treat general pain and discomfort. This balm will help you get back into the game for maximum performance. Inflammation is the main cause of pain for athletes and workout-enthusiasts. When you want to grow muscle, you need to push yourself and your body to the limit. Just mildly exercising or training without any soreness does not increase your muscle base. When you exercise to become faster, stronger and better, you start feeling your muscles. While muscle soreness is a sign that your muscles are growing, it also indicates that there is some inflammation in these muscles. Minor inflammations are generally handled by your immune system, but there is a fine line between muscle growth and chronic muscle inflammation. It is all too easy to overdo it in the pursuit of athletic success, which can cause severe muscle inflammation that needs to be treated. With regular overexertion, many of these inflammations can become chronic. As CBD is one of the best anti-inflammation supplements on the market, it is indispensable for risk reduction in athletic and fitness activities. Pain, it’s all in the game. When it comes to fitness and workouts this is unfortunately true. Traditional ‘big pharma’ pain meds are often ineffective for chronic pain and can have nasty side-effects. CBD is not addictive and has no side effects other than a dry mouth when high dosages are used. Your body does not develop tolerance to cannabidiol, making it an ideal supplement for athletes and workout fanatics. The dosage for pain varies from 40 to 100 mg per day, divided into two or three doses. The exact quantity depends on the amount of pain. People usually test different dosages to see what works best for them.